Viktor Ullmann, son of an army officer, was born in Tesin, Bohemia. As a young man, he fought in World War I. 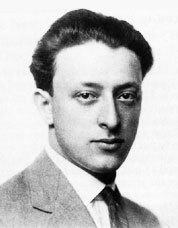 He then lived in Vienna where he studied composition under Arnold Schoenberg. 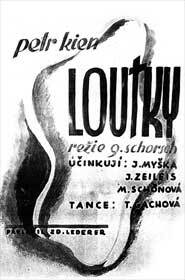 He was recommended by Schoenberg to the famous Alexander Zemlinsky who headed the New German Theater in Prague. In contrast to Hans Krasa, a Bohemian, Ullmann had to work hard to earn his living — by lessons, writing, lecturing and working for the Czech radio. He was deeply immersed in musical life, and staged public debates about modern music that attracted hundreds of fans. These meetings continued up to 1940. In Terezin, Ullmann and his works were highly respected by prisoners. He wrote in a letter that he was satisfied with the 'understanding public.' However, he was never recognized as a 'prominent' — his military merits were disregarded — and he shared the fate of so many others. Viktor Ullmann's outspokenly non-Jewish, devout antroposophic and Steinerian perspective, underwent a crucial change. He adapted Hebrew and Yiddish songs for the boys' choir and dedicated them to his son Max. In his Seventh Sonata, he included variations on a Jewish theme inspired by the Song from Palestine by the famous Hebrew poetess Rachel, and by its music written by the folk composer Yudah Sharet. And finally, in his breathtaking trumpet calls in The Emperor of Atlantis, he directly quoted Josef Suk's cantata Asrael [Hebrew: The Angel of Death]. As always, Ullmann was in the thick of things: he was the founder of the Studio for New Music where modern pieces and those written in Terezin were played, he was the FZG worker responsible for arranging musical rehearsals and for writing critical pieces (27 articles survived), and he was a public lecturer — sometimes addressing youth (e.g. Emil and the Detectives), sometimes a wider audience. In less than two years, he completed sixteen compositions. He wrote his diary in verse and called it The Strange Passenger. While going to the transport, this 'strange passenger' took all his creations with him. At the last moment, however, he changed his mind and left them with his good friend Prof. Emil Utitz. If he didn't return, he said, the works should be passed to the historian H.G. Adler. Utitz fulfilled the composer's last wish. Among the works was a musical cycle on H.G. Adler's verses, written as Japanese haiku and titled Man and His Days. His works also included a kind of requiem, the melodrama Of Love and Death of the Cornet Christoph Rilke. We call your attention to one of Victor Ullmann's short essays in prose, in which he was, perhaps, no less skilful than in his musical masterworks. The text is slightly abridged. The libretto of The Emperor Of Atlantis or Death Abdicates was written in Terezin by young Petr Kien. Born in 1919 in a Czech border town Varnsdorf in a factory owner's family, Kien received his education at the German gymnasium in Brno. Quite early, he started to draw, play music and write verse. In 1936 he joins the Art Academy in Prague. His drawings, poems, film scripts and essays in German evoke interest, and some are published. In 1939, as the racist laws are introduced, Petr quits the Academy, but continues to study in a private graphic design school Officina Praguensis. In December 1941, Petr Kien is dispatched to Terezin. He is assigned to work at the Technical department. Together with other artists, he carries out Nazist orders for graphic works and the 'beautification' of the town before the Red Cross commissions' visits. He also draws protraits of his friends and makes numerous genre sketches. His social satirical play Puppets, written in the camp, is staged by Gustav Schorsch. In October 1944 Petr Kien joins his parents and his wife in the transport going to Auschwitz. Nobody survived. 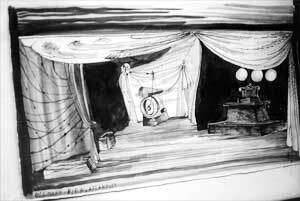 The play Puppets written in the camp by young Petr Kien was Schorsch's first Terezin performance. It said the modern society was a totalitarian machinery nightmare in which human beings were marionettes, controlled by an invisible hand. The idea of Omnipotent Evil was too obvious under the situation, but an immediate motive to the play was the mass repressions following Reinhard Heydrich's assassination. Unfortunately, neither the author, nor the play survived. E.M.
Poster for Petr Kien’s Puppets. Rafael Schaechter, outstanding counductor and pianist, born 1905 in Romania, took music lessons in Brno, then graduated from Prague conservatory. Since 1934, Schaechter worked as a pianist in the famous E.F. Burian Theater, and as a singing-master. In 1937 he established the Chamber Opera where forgotten baroque music was played. Due to Nazi persecutions, Schaechter was cut down to private lessons and home concerts. As Schaechter arrived in Terezin in November 1941, he was appointed to the fire brigade. How long he was a fireman is not known, but it is known that in early '42 he established a choir. 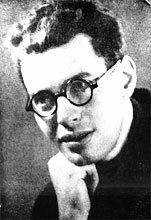 In one of the concerts, for example, 15 songs were sung in Czech and Hebrew, 13 of them arranged by another Terezin musical star, young composer Gideon Klein. In the summer 1942 Schaechter began to rehearse the opera The Bartered Bride by the Czech composer Bedrich Smetana. In November the first performance, yet without set and costumes, took place. "For a Czech, The Bartered Bride is a folk opera, it is associated with all the previous life", a singer Bedrich Borges relates: "A Prague Jew is one third a Jew, one third Czech and one third German… And there, we were also Czechs, not only Jews. I remember, when we started to sing 'How Could We Be Happy', I was looking from the choir at the people — they were crying. In Terezin, one felt such things stronger than in the normal world. Rafael Schaechter literally poured spirit into people. I remember, for example, how he was working with choir in opera The Kiss. I didn't sing and sat in the audience; I looked at Schaechter and thought I was looking at Johann Sebastian Bach. The man was simply impregnated by music, a rock of a man…"
After The Bartered Bride and The Kiss (also by Smetana) the following operas were staged, already in scenic versions: The Enchanted Flute and Figaro's Marriage by Mozart, La Serva Padrona (The Maid Turned Mistress) by Pergolesi, and finally, Bastien and Bastienne, Mozart's idyllic pastorale with children's choir. Requiem by Verdi became Schaechter's apotheosis. He started rehearsals in mid-1943 with a choir of 150 people and four soloists. Soon after the premiere, half of the cast was washed away by September transports. Schaechter recruited another troupe, rehearsed with them thoroughly, and set the Requiem on stage again. The end of December transports devastated the choir — 40 persons were shipped away to the death camps. And Schaechter staffs the third, and the last, cast. They perform the Requiem 15 times. Finally, the cast is deported together with the conductor… E.M.
Hans Krasa (1899-1944), pupil of Alexander Zemlinsky, took on a leading role in Terezin. Krasa was the author of three operas, symphonies, violin concertos, and music for plays, and he was awarded a National Prize of Czechoslovakia in 1933. As a member of the Free Time department, he headed the musical section. This freed the composer from physical work and enabled him to continue creative work. In his Terezin compositions, he makes fun of the absurdity of life. As such, it contains no tragic motifs. Hans Krasa's life had its ups and downs. He was born into a well-to-do family. The house had two pianos. Hans wrote his very first composition at 11, and it was performed by the Salzburg Symphony. In short, he knew nothing but success and recognition. He was a Bohemian who got up at noon, gave private lessons only to children from rich families whom he loved, frequented fashionable clubs, played chess, and traveled, especially to Paris where his music was cherished by the French avant-guard. 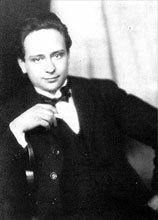 In 1926, the Boston Symphony Orchestra conducted by Serge Kousewitsky played Krasa’s symphony. He befriended writers, poets, artists. Quite a few of his works, for instance the opera Uncle's Dream that was based on Dostoyevsky, or song cycles based on works by French poets, were an indicator of his close ties with literature. A popular Czech playwright Adolf Hofmeister was among Krasa's friends. The fruit of their collaboration, the famed children's opera Brundibar (Bumblebee), popped up in 1938. It could not be staged — the Munich conference changed everything. Hans Krasa's sister and brother hurriedly left Czechoslovakia. Krasa’s attempts to escape were futile. Judging by the number of the works he created in Terezin and by the active role he played in the musical life of the ghetto, Hans Krasa seems to have hardly slept at all. Brundibar was premiered in Terezin. Good triumphed over Evil, but unfortunately only on stage. The author himself was grabbed by the real Evil and killed. His last composition, Passacaglia and Fugue, was finished two months before his death in Auschwitz. E.M.